Tender, juicy, flavorful. 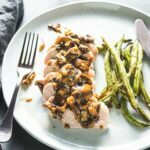 The perfect pork chops are made in the sous vide and quickly finished in a skillet. Pork that is lean will dry out when cooked too long or at too high of temperatures. That’s where the sous vide method comes in. 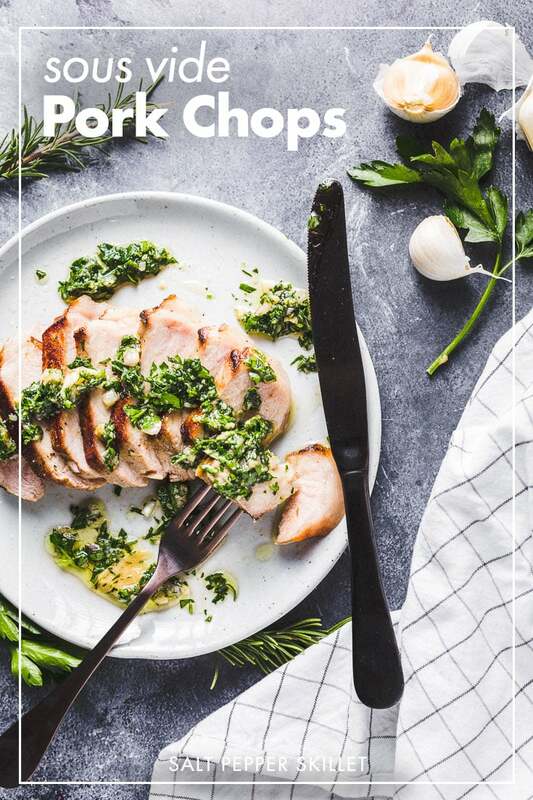 Why sous vide pork chops? When the chops are cooked in a sous vide bath they are cooked to the exact perfect temperature that you are going for. No more and no less. Unlike cooking on the grill or oven, cooking them sous vide gives you a ton of variability in the time they cook. They will be ready to eat after 1 hour but can stay in the water for up to 3 hours. The only change that happens is they become a bit more tender the longer they ar ein the bath, but they don’t overcook. Yep, it’s true. 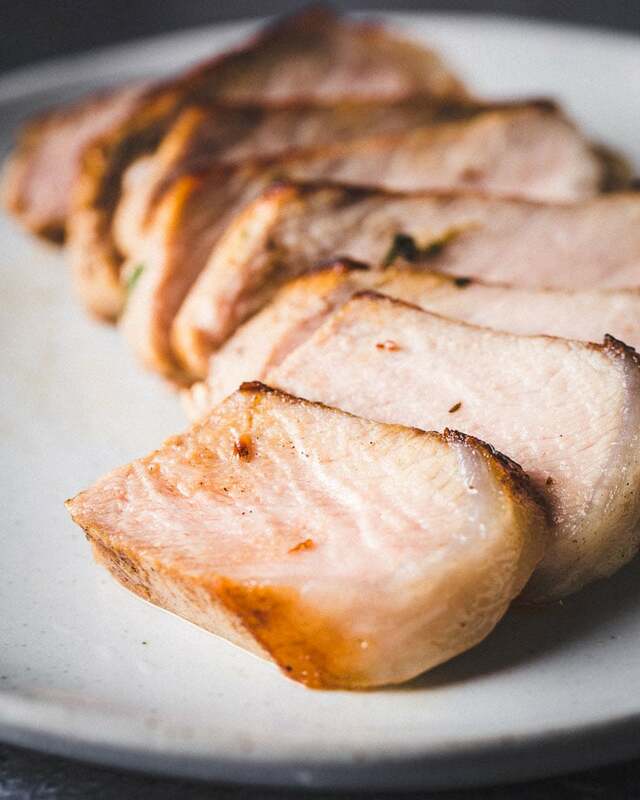 Better quality pork tastes better and is better for you. 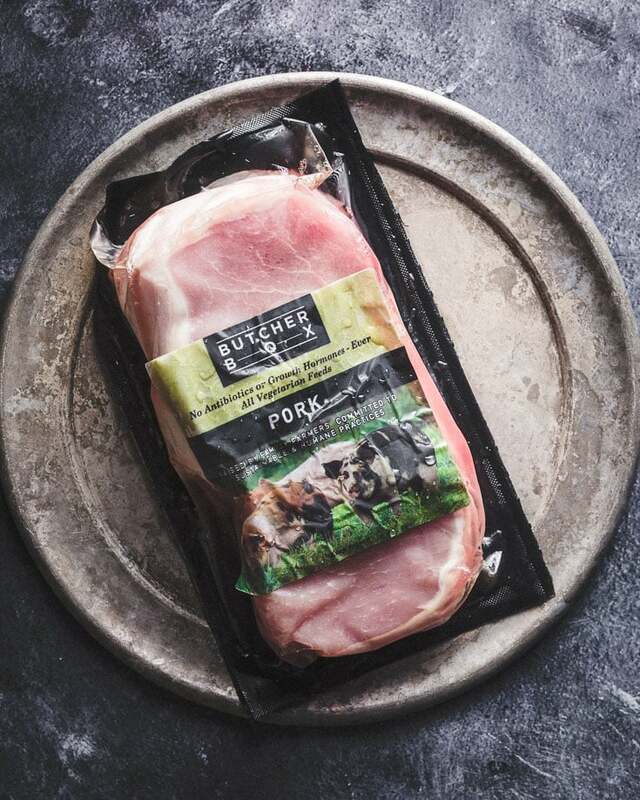 Whether you source from your local butcher or have heritage pork delivered to your door from Butcher Box (what I did for this recipe). No antibiotics or growth hormones are ever used to raise these animals. I totally recommend trying out Butcher Box. The quality and flavor of all their products have been noticeably superior to most found in the grocery store. 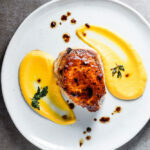 Can you cook frozen pork chops in the sous vide? Yep, you definitely can! Just do step one of the recipe and then place the prep’d bag right in the freezer. It will be ready to go and is perfect for meal prepping. Just add an extra hour of cooking time when using frozen pork chops. 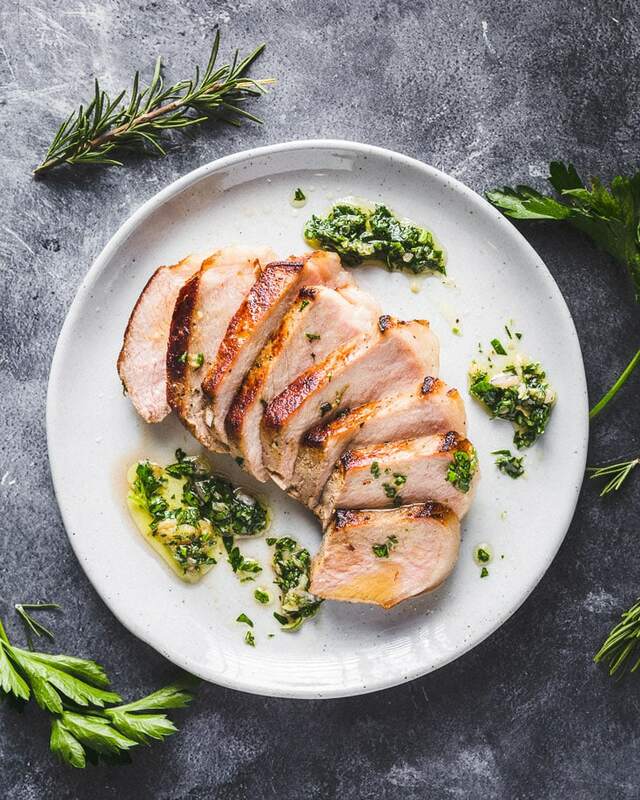 Should you brine the pork chops for sous vide? Brining pork chops is usually a great thing to do to help get juicy chops, but brining it is totally unnecessary when cooking them sous vide. They will come out perfectly juicy and tender using this method without brining. When people first see a sous vide machine, they might think it’s some crazy science experiment going on. While it sort of really is, luckily for us, the scientists have already done all the work. of is. Cooking sous vide is no different than just boiling water and cooking pasta. It’s actually easier than cooking pasta because you don’t have to stop the cooking at the exact right time. Pork chops are a perfect candidate to take on some seasoning while they cook. Adding garlic, fresh herbs such as thyme and rosemary will add wonderful flavors to the chops. ** Browning the chops after they are cooked in the sous vide is optional, but it adds tons of flavor via the Maillard reaction and makes for a much more beautiful presentation. 1. 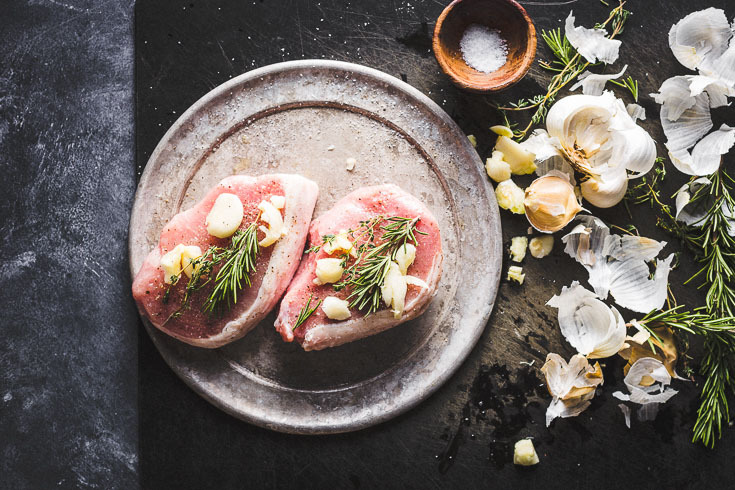 Season the pork chops liberally with kosher salt & freshly ground pepper; placing a few fresh thyme sprigs, rosemary sprigs and crushed garlic cloves on each side of the chops. If using a sauce, add that to the bag then add the chops. 2. Vacuum seal or get as much air out as you can if using a ziplock bag. 4. Place the chops in the refrigerator for 1 hour before cooking. 5. 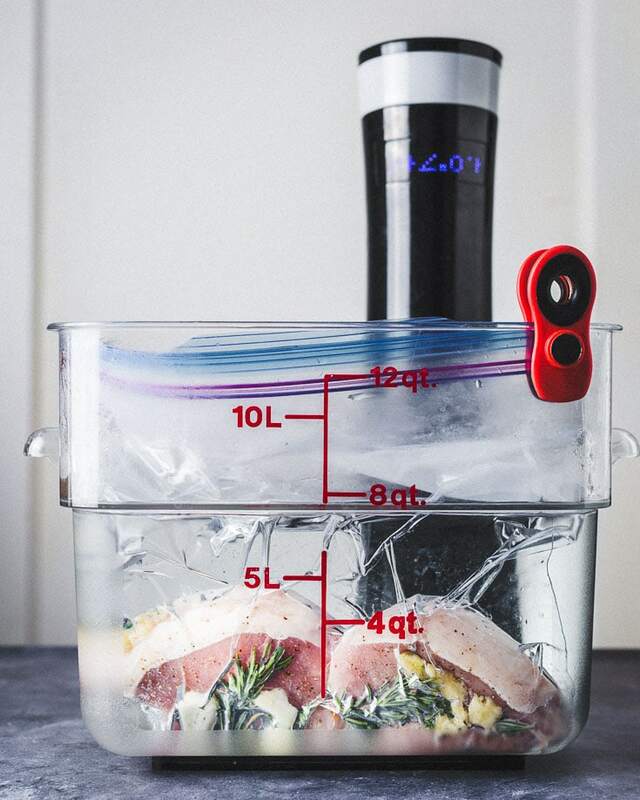 Fill a large pot or container with water and set the sous vide machine to 140° F.
6. Clip the bag to the side of the pot or container to keep it in place and cook the chops at 140° F for 1 hour and up to 3 hours (same result within this time window). 1 1/2 hours is best. 7. Remove from the bag and dry the chops as much as possible with paper towels. 8. Brown the chops by searing them in hot oil and basting with butter and herbs for 30 seconds to 1 minute on the first side and 30 seconds on the second side. 9. Rest for 5 minutes before serving. Place all contents into the bag and partially seal it, leaving a few inches unsealed. Push as much air out of the bag as you can with your hands. Slowly lower the bag into the sous vide water bath (always keeping the opening of the bag above water). As you lower the bag, the remaining air will be pushed out. Seal the bag and clip it to the side of the container once all of the air is out. The pork chops are ready to take on any flavor you are in the mood for. 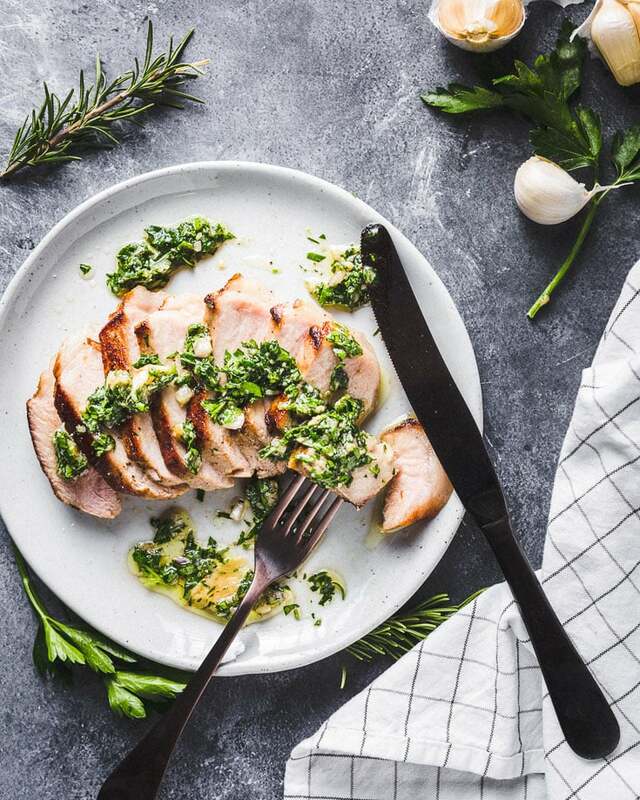 Try using your favorite bbq rub or sauce, pesto, dijon mustard, honey garlic, go Asian with a soy-honey or teriyaki or any other marinade you can think of. They will all work great for cooking pork chops in the sous vide. If using marinades that are high in sugar, you will want to be careful during the searing step, as they can easily burn. The sauce pictured in this post is super easy and no cooking is required. It’s a little like an Italian salsa verde, but without the anchovies and capers. Finely chop up some Italian parsley, shallots and garlic. Place it in a small bowl and drizzle in some lemon juice, zest from the lemon, a splash of red wine vinegar, and season with kosher salt and freshly ground pepper. 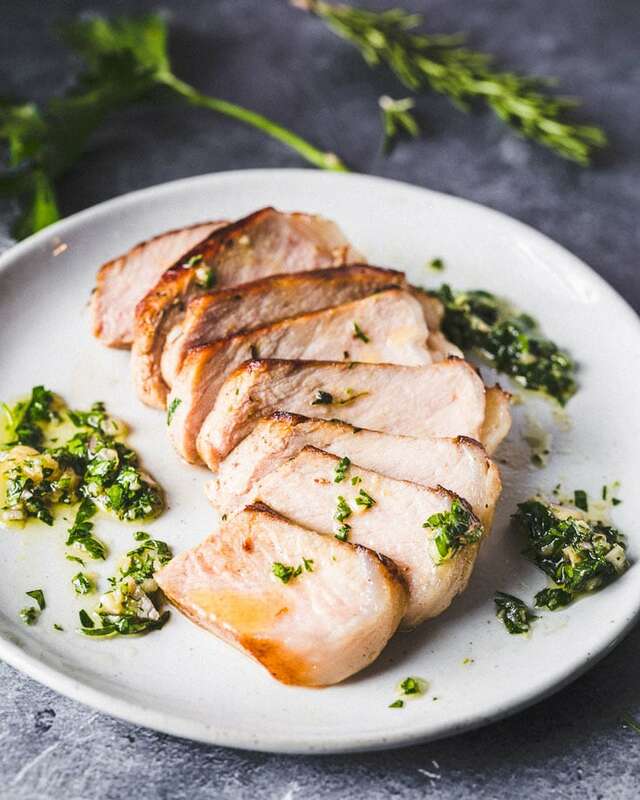 This sauce will add a wonderful freshness and brightness to the sous vide pork chops. Serve up one of these pork chops and everyone will be happy even if you don’t have a side. But since you probably don’t stop there, serve it with a side like sous vide carrots (recipe below), green beans, crispy brussels sprouts, mashed potatoes, crispy potatoes, roasted mushrooms, or your favoirte salad. 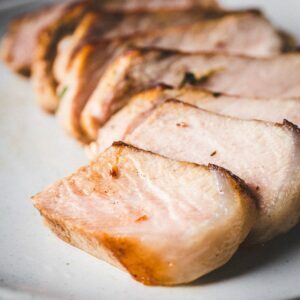 You can put your sous vide to work while the pork chops are hanging out in the refrigerator for an hour. To make sous vide carrots; set the sous vide temperature to 183 degrees. Place the carrots in a ziplock bag with kosher salt, pepper, thyme, butter and a little maple syrup. Cook for 1 hour until the pork is ready to cook. To finish the carrots; heat a skillet with the carrots into the skillet give them a little color and probably more salt. The best method for browning sous vide meat has to be the quickest method. 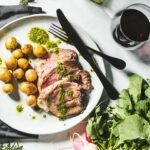 The longer the cooked sous vide chops have to be in contact with the heat source, the more they are going to cook, and they are already fully cooked. 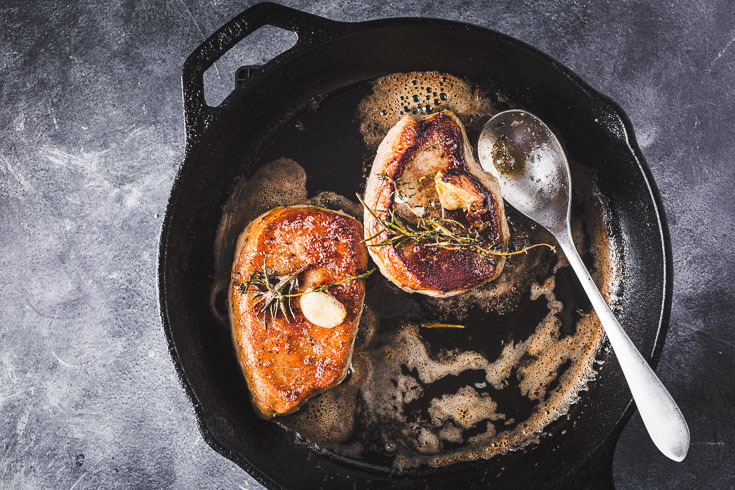 Searing in a super hot cast iron skillet with plenty of fat is the best and quickest way to get a nice brown crust and add tons of flavor on the sous vide chops. The chops must be totally dried off with paper towels before searing, or they won’t brown. If the skillet doesn’t have enough fat or isn’t hot enough, they won’t brown. A hot grill can also be used to brown the chops; but it usually takes longer to pre-heat a grill than a skillet and can take longer to brown, resulting in overcooked pork. Why the variation in cooking times? It’s really just a minimum and maximum time to leave it in the water. The longer the pork is in the bath, it will become more tender, but not necessarily more cooked. 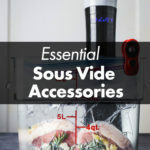 You can see the equipment used (below) or check out the post all about Essential Sous Vide Accessories. Contains affiliate links where I might receive a commission if you make a purchase, at no additional cost to you. 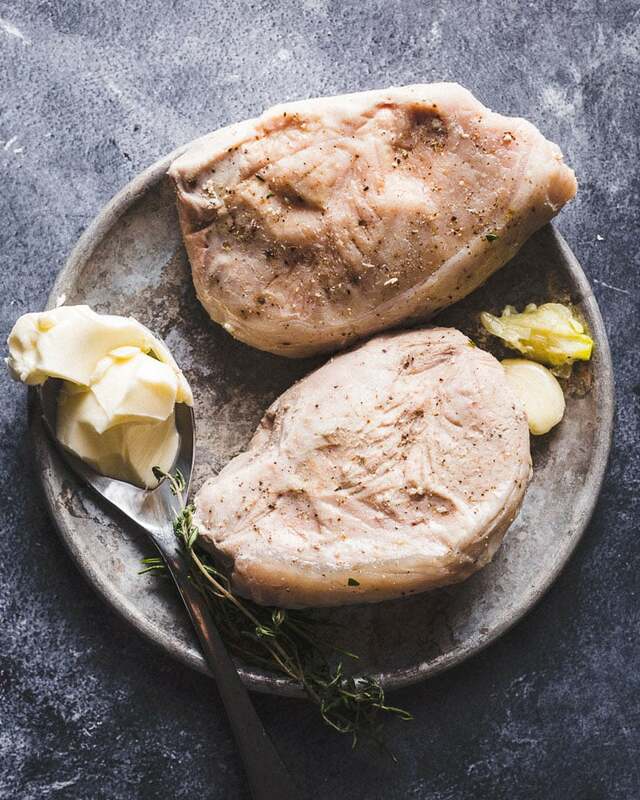 Drizzle some olive oil on the pork chops and heavily season on all sides with kosher salt and freshly ground pepper. 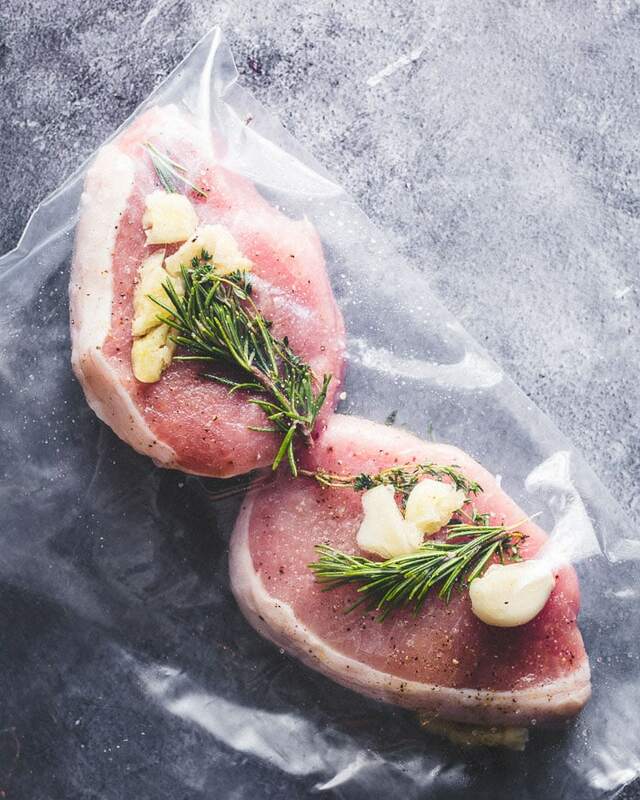 Add a few sprigs of fresh thyme a sprig of rosemary and the smashed garlic cloves to the chops, then place in a zip lock freezer bag or a vacuum seal bag. Refrigerate for 1 hour (this is optional, but will allow the salt and flavors to season the inside of the pork). Bring the water bath to the desired temperature (140 degrees F recommended for medium). Submerge the bag into the sous vide water bath for the desired time (1 to 3 hours). See note 2 below for how to remove air from the bag. Remove the bag from the water bath and the chops from the bag. Pat as dry as possible with paper towels. Heat a heavy cast iron skillet over high heat until it starts to smoke. Drizzle in canola oil to coat the bottom of the skillet. Carefully place the chops in the skillet. Lightly press the chops into the hot oil and sear for 30 seconds to 1 minute. While they sear, add 2 tablespoons butter, a few thyme sprigs, rosemary sprigs and smashed garlic cloves to the skillet. Continually baste the butter and herbs over the chops with a large spoon. Flip the chops and continue to baste for 30 seconds. Remove and rest the chops for 5 minutes before serving. 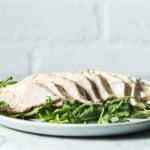 This recipe is for two chicken breasts but works the same for more or less quantity. Remove air from the bag is important. If using a ziplock bag; partially sealing it and push out as much air as you can by hand. Then partially submerge the bag in the sous vide water bath to force the remaining air out of the bag, then fully seal it (always keeping the top out of the water). Clip the bag to the side of the container so it stays in place. The thyme, rosemary and garlic from the bag can be used again when searing the chops to baste in butter. Just be sure to dry them off to minimize oil splatter. The best and most essential accessories for sous vide cooking. From sous vide containers to bags. 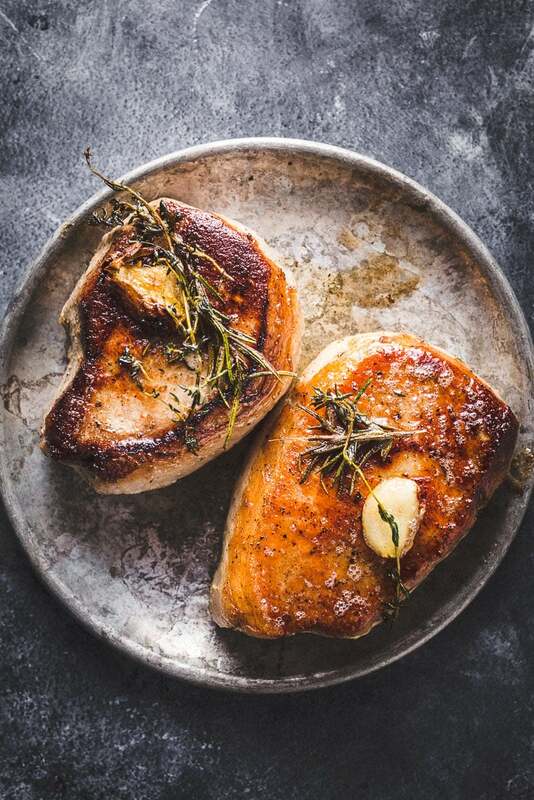 The easiest way to perfectly cook juicy, tender boneless skinless chicken breasts every time. Simple, flavorful, and tender! YUM! !